If you ask any mother of young children about taking their kids out in the car, they will tell you that it is crucial to have a car travel kit of some description with you that’s always available when you need it. Kids by their very nature can be somewhat unpredictable, so the last thing you want to do whilst you are on the motorway with your kids in the back of the car is to not be prepared if one of them becomes ill during the journey or is ‘caught short’ and cannot wait until you pull over to the nearest services so that they can go to the toilet! There are also times where children may have injured themselves, and you have to attend to a child screaming in pain from a wasp sting or accidentally cutting themselves on sharp objects on their travels, for example. Apart from having a practical car to offer comfortable journeys for you and your young passengers (check this website out if you don’t have such a car yet), here are the essential items that you should have in your car travel kit. One of the most-common complaints that you will ever hear from children that are in the car with you is that they are hungry! Children grow at such an alarming rate that it can sometimes be too easy to forget how fast your kids grow up! In order for them to grow and be healthy and strong, they will obviously need to munch on some good food on those long car journeys. Whilst it might be easy to just give in and provide them with chocolate bars and other candy, such food is bad for your kids and can obviously cause them to have problems with their teeth, as well as making them gain too much weight. It has to be said that young children are pretty clumsy as they find their way in the world, and because of their clumsiness, they will often end up walking into things or hurting themselves in some way without realising what they have done! Therefore, one seriously essential collection of items you should in your car has to be a first aid kit! Inside a first aid kit, you will find a plethora of handy medical items such as plasters, cotton wool, scissors, bandages, and antiseptic creams designed to provide assistance in all sorts of minor medical emergencies. These inexpensive items are handy for all sorts of reasons! Apart from being useful for snotty kids that are suffering the effects of a cold (or hay fever), tissues are also great when you need to clean up any accidental spills, as well as promoting hygiene and cleanliness with your children. Another useful set of items which can be used in a number of different scenarios are blankets. They are great for when your kids are feeling cold, and in the warmer months of the year they are perfect for impromptu picnics in the sun! i think these essential list is not only good for kids, but also for us adults. we always don't know what could happen. The photos shows an extreme precaution about seatbealt. It is safe but my kids would not be comfortable with three seatbelts. What you listed are all essential items to have when you're traveling by road. You can always be safe than sorry. When we travel especially out of town i see to it that i bring my daughter vitamins, paracetamol and her tab and some books. 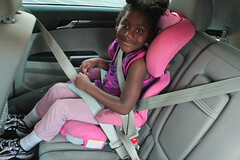 Moms should always have on hand those essentials you listed when on the road especially with kids around. Need a big bag always to put those essentials too. These essentials are universal for kids and adults alike while going on a road trip or even just to have in the vehicle all the time.